Is your child spending too much on computer? Well, its time to restrict computer usage and this does not involve lot of efforts. 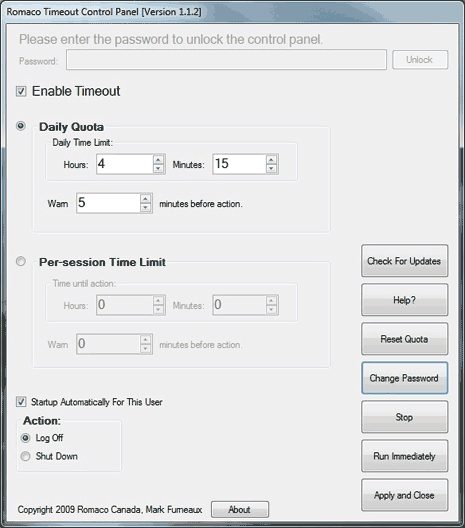 Romaco Timeout is a free application that allow restricting computer usage to specific amount of hours in a day. Different usage time can be set for different user accounts on the computer. It has easy to use interface. To get started, select amount of total daily hours qouta of time allowed for computer usage. It warns user 5 minutes before the actual log out / shutdown time. You can set computer to log out or shutdown once daily hours quota of use expires. Other computer users cannot change qouta restrictions. You need to enter password to unlock control panel to disable or change hours quota for specific computer users. Romaco Timeout for sure is one easy way to restrict kids computer usage without bells and whistles. Alternatively, you can block specific websites (to facilitate productive internet surfing)!